DALIX brings you the most economical and useful apron for less. 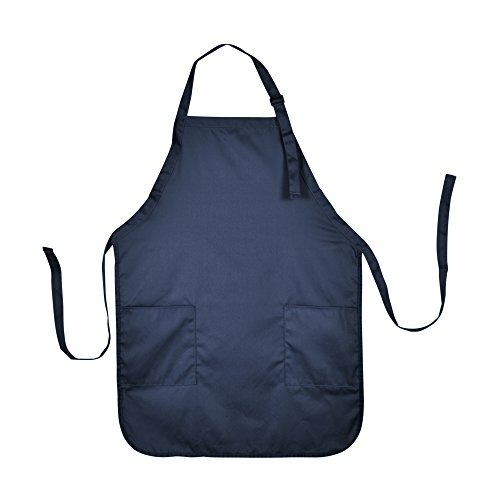 Standard in the industry as poly-spun cotton material, this apron comes in 6 different colors, perfect for home, commercial, industrial uses. Whether you're an avid cooker intersted in culinary arts, or working as a painter, bbq host, or need some protection from the elements, this apron will be able to keep your clothes clean underneath. An added feature is that this apron can be imprinted on or embriodered for custom business logos your name, promotional items, and much more. Check the different color options or contact us if you have any questions about our products. SIZE: 22" x 30". IMPRINT AREA: 7" x 9". FEATURES: 2 FRONT POCKETS. MATERIAL: 7 OZ. POLY-COTTON. USE: PERFECT FOR COMMERCIAL, RESIDENTIAL, SMALL BUSINESSES, AND HOME. ADJUSTABLE STRAP FOR MULTIPLE SIZING. Chose Your COLOR: ROYAL, RED, BLACK, NAVY BLUE, DARK GREEN, WHITE Note this comes in a 72 PACK so you will be receiving 72 Aprons! IMPRINT AREA: 10" x 5"